One of the things monitors sometimes find in their samples -- often to their consternation -- is a pupa of a true fly or a caddis. When I was working with StreamWatch, we counted these right along with the larvae: some of us could identify the pupae of crane flies (pictured above), black flies, and midges in the field, caddis pupae -- especially when they were still in their cocoons -- had to be preserved and identified in the lab. Lab ID of caddis pupae was something we dreaded -- it's not easy to do. But to our delight, DEQ informed us last year that pupae of any sort could be ignored; they should not be counted as part of a sample. Still, these are things you might see in a stream, so let's have a close look at some examples. The odd looking creature at the top of the page is a crane fly pupa -- something we saw only rarely. More commonly found in our samples were midge pupae, which could be found at almost any time of the year (there are a lot of midges hatching right now). Here is a picture of what they look like (though they can be various colors, and they're often black). The other true fly (Diptera) pupa we commonly saw was the black fly pupa -- a strange looking critter indeed. You could hardly mistake it for anything else, though it's strangely attractive! Caddisflies, like true flies, are "holometabolous," that is to say, they live a full life cycle of egg, larva, pupa, and adult (terrestrial). (By contrast, mayflies, stoneflies, dragonflies, and damselflies are "hemimetabolous": they omit the pupal stage, going from egg to nymph to adult.) So, on occasion we find caddis pupae as well. But these we can find in various stages of development. And this often depends on the "type" of caddis we find: remember that there are "case-makers" (Integripalpia -- Wiggins), 2) "net spinners" (Annulipalpia -- Wiggins), and 3) "cocoon makers" (Spicipalpia -- Wiggins). Odontocerids, Uenoids, Brachycentrids...are all "case-makers": "Common netspinners, Fingernets, and Trumpetnets are all "netspinners (or retreat makers): and the free living caddis and the saddle case-maker are both "cocoon makers". (For these distinctions, see Glenn B. Wiggins, Caddisflies: The Underwater Architects, pp. 11-28 and 59-71). With the "case-makers" we often find the pupae snugly sealed in their cases. When case-makers pupate, they simply seal up both ends of the case they've been in all along, weave a cocoon on the inside (which is "glued" securely to the case) and transform from a larva into a pupa. (By the way, caddisflies [Trichoptera] and butterflies and moths [Lepidoptera] are descended from a common ancestor -- hence the use of cocoons in transformation [following Wiggins]. The cocoon is permeable, and water flows through openings in both ends of the case providing oxygen to the larva/pupa. Below is a remarkable picture showing a "grill" or "grate" at one end of a case that provides water access. And here is a picture of the whole case, clearly showing how both ends of the case have been sealed. Since the cocoon is firmly sealed to the case, it is impossible to remove the pupa from a sealed case of this sort without making a mess of it: we never tried to ID the pupae in these situations. I did once find a case from which the pupa could be removed -- though I don't recall how I did it. There was no doubt in my mind that this was a Strong case-maker (family: Odontoceridae), mostly because of the manner of case construction. Here is a look. The head of the pupa is visible on the left. What about the "net spinners"? Netspinners also weave cocoons after building domes made of pebbles for protection, the domes then secured to rocks. If you peel that dome off of the rock, the cocoon is clearly visible since no bottom is put on the dome. However, the cocoon cannot be removed from the dome. We do find these domes from time to time with the cocoons still inside, and inside the cocoon we normally find a Common netspinner pupa. One is pictured below, having been removed from its cocoon. Pretty freaky, but that's what they look like. Finally, we have the group called the "cocoon makers" by Wiggins -- the free living caddisflies, saddle case-makers, and micro caddisflies. While all caddis larvae weave cocoons, this group makes a special type of cocoon. This cocoon is rigid to the degree that water cannot flow through it, but it is "semi-permeable" so that the dissolved oxygen in the water that enters the case reaches the pupa by osmosis. Also, this cocoon is not "glued" to its domed case of pebbles. So it can be removed from its protective shell without causing harm. In fact, in samples, we often find the cocoons all by themselves. Such cocoons are easily recognized because they have the look and texture of "parchment paper" (Wiggins). The pupa inside is either that of a free living caddis or a saddle-case maker. I have three photos to show you: in all three the pupa inside the cocoon is -- I'm pretty sure -- a free living caddis. The first two photos are of the dorsal and ventral view of a cocoon in which there is a free living larva which has, as yet, transformed very little. Note that in the dorsal view, the "curvy" black line forming the back edge of the pronotum -- characteristic of the free living caddis larva -- is clearly visible. While in the ventral view, the full legs of the larva are still intact. In the other cocoon in my collection, the pupa is much more advanced in its transformation. This is the dorsal view. The "junk" at the rear end of the case is the larval exuviae (i.e. parts of the larva that have been shed in its metamorphosis into a pupa). By the way, to determine for sure if this is a free living pupa or a saddle case-maker pupa, the pupa would have to be removed from the cocoon, and the tops of the abdominal segments (which are clearly visible in the picture) would have to be studied to count up the "pairs of hooked plates" on each of those segments: it's a pain! It's very considerate of the mayflies and stoneflies not to put us through all of this work. 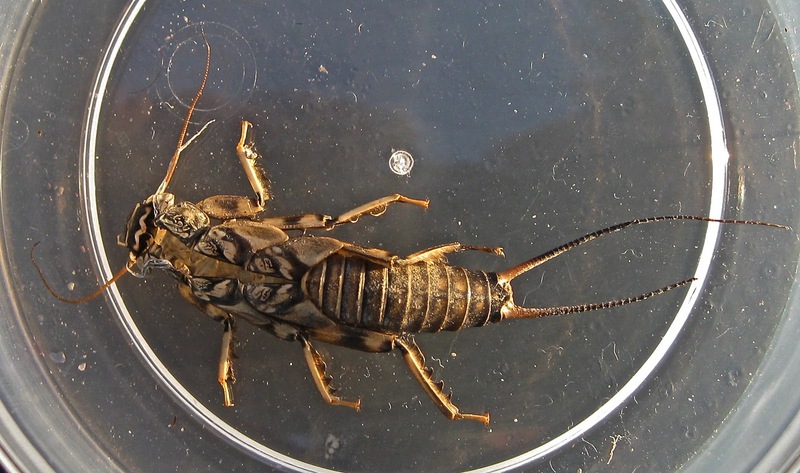 When they're ready to hatch, they simply swim to the surface, or crawl to a rock on the side of the stream, break open their skins (exoskeletons), push up and dry off their wings, and off they go! 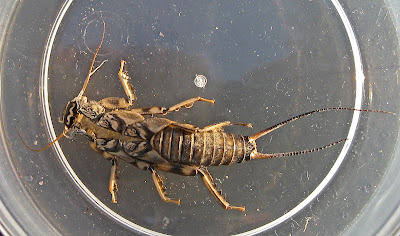 Stoneflies often leave "shucks" behind which you can find as you walk by the edge of a stream. The one below is that of a Common stonefly (genus Agnetina), and you can clearly see where it has cracked open its thorax to gain its freedom. Professor of Chinese Religions at Dartmouth College, 1976-2006. Avid fly fisherman who developed an interest in benthic macroinvertebrates while volunteering with StreamWatch in Charlottesville. For more of his photos, go to https://www.flickr.com/photos/aquaticinsects_of_central_virginia/sets/. Rapidan River off Graves Mill Rd., Pt. II.